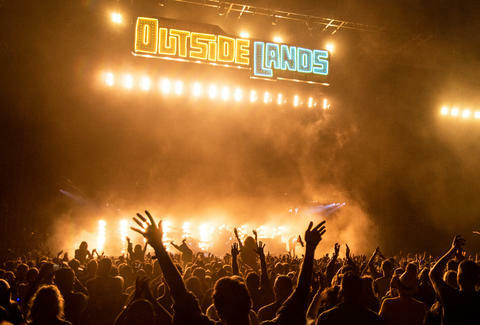 Celebrating its 10th anniversary this year, San Francisco’s Outside Lands Music and Arts Festival (August 11-13) is sure to be filled with more awesome acts, food, beer, wine, art, and comedy than ever before. The inaugural festival in 2008 set the precedent, as 60,000 eager people gathered to see Radiohead play the first-ever live rock performance in Golden Gate Park after 7pm. Since then, organizers have been looking for ways to outdo themselves -- and you know they’re gonna turn up for this milestone. You definitely want to be one of the expected 210,000 concert-goers, and we definitely want you to be prepared. Read on for your all-inclusive festival guide. Tickets to Outside Lands aren’t sold out (yet), but it will cost you a pretty penny if you want to attend all three days -- $375 to be exact. Can’t spring for that? Single-day tickets are also available and cost $149.50/day. If you were feeling fancy, you’ll be bummed to hear that the 3-Day VIP ($795) is sold out. Single-day VIP tickets ($345) are still available and will get you exclusive Polo Club seating (with shade and special activities), admittance to special viewing areas, special restroom facilities, and access to VIP food, wine, beer, and spirits. Like most festivals these days, you get one wristband for the entire weekend and it can’t be removed once it’s on. Wristbands that have been tampered with will be void and if you try to enter, you’ll be denied -- and that would seriously stink. If you want to get inside as fast as possible, put all of your stuff in one of those cool clear backpacks. Anyone who brings a backpack or purse will be subject to delayed entrance and longer lines, meaning you could miss your favorite band. As far as what can go inside that bag? Bring a blanket, empty water bottle, binoculars, and sunscreen. But leave your booze, skateboard, professional camera equipment, tents, spray paint, and dog (sorry, Rocky) at home. If you live in SF, you know this already, but this town gets cold in August. Like, really, really cold. And when the fog rolls in, it gets even colder. It might be sunny and warm when you leave the house at 11am, but it definitely won’t be by late afternoon, so leave your “festival outfit” in the closet and bust out those strategic layers instead. And at the risk of sounding like your mom: Wear sensible shoes. Or, hey, go ahead and wear your Reefs, just know you’ll resent the sound of every flip and flop when you’re making the long trek out of the park at 10pm. Don’t feel like crashing on a friend’s couch? We feel you. The Phoenix Hotel is where all of the musicians stay when they’re in town (and it has a cool bar and a pool). Hotel Kabuki in Japantown is the a tranquil place to get a good night’s sleep (and it’s close to some of SF’s best karaoke bars if you want to play rockstar after hours). Hotel Carlton in Nob Hill has an eclectic, laid back vibe and awesome city views. The N Judah and 5 Fulton are probably your best bet, but don’t expect a seat. Last year 68,000 people took Muni to and from the festival. In fact, the crowds will be so crazy after the final act, you might not be able to board the trains at all. The good news is that Golden Gate Park is relatively flat compared to the rest of the city. But it’s still a pretty decent hike from a lot of neighborhoods. If you’re coming from the Sunset (south), enter at 25th and Lincoln. From the Richmond District (north), enter at 25th and Fulton. Just follow the crowds 'til you find the party. Don’t let the festival grounds overwhelm you. Instead, familiarize and strategize beforehand. Download the free Outside Lands app before you go to the festival and use it to create your custom schedule. It’ll send you alerts so you know when you need to start heading over to another stage. Plus, you can use it to see where your friends are, make a list of all the food vendors you want to try, and it even has a map for when you inevitably get lost. Pretty much any information you’ll need over the course of the three days is on the app. With over 200,000 people at the festival, you’re going to want your phone alive so you can find your friends, access the app, and take videos and Instagrams of all those crazy amazing performances (even though you’ll never watch them again). To help your battery last longer, put your device on Airplane Mode when it’s in your pocket or bag, and consider bringing a portable charger. If your phone does die, don’t stress: There are charging stations throughout where you can power up. While beer is made with water, it’s not actually a substitute for legit H2O. The day is long and being dehydrated is the quickest way to lose steam. Bring an empty bottle or hydration pack from home and fill it up with free, freshly-filtered water at the water stations in Polo Field and Eco Lands. If you forget your bottle at home, refillable water bottles will be available for sale at each location. Outside Lands is almost as much about the food and drink as it is about the music, which means you definitely don’t want to skip it in favor of a PB&J that’s been smushed at the bottom of your bag all day long. More than 80 Bay Area restaurants and food trucks will be on hand to tempt you with tasty culinary delights. And while only you can make the important decision of where to spend your money, we highly recommend checking out first-timers Alba Ray’s (serving up Creole jambalaya and chicken & andouille gumbo) and Marlowe (fueling you up with its delicious bacon burger). You may also want to eat Rich Table’s famous porcini doughnuts with raclette cheese, all of the baos from The Chairman Truck, wood-fired pizza from Del Popolo, and morning buns from Tartine Manufactory. Be sure to also check out Chocolands “where all your chocolate fantasies come to life”; Cheese Lands where you can get all things dairy; and Outside Clams where you’ll be able to partake in all things crustacean. And honestly, definitely do that because there will be more than 40 Nor Cal wineries, including Banshee, Scribe, Dry Creek, and Long Meadow Ranch pouring over 120 wines. While you’re there, check out The Back Wine, a “sip and putt” mini golf area with adult grape juice from Cannonball Wine Company. Is there anywhere more magical on earth than Beer Lands? Not for three days in August there isn’t. Just look for the towering beer mug where more than 25 West Coast breweries like 21st Amendment, Anderson Valley, Fort Point, and Mendocino Brewing Company will be pouring all that golden goodness. FYI: If you’re not in Beer Lands, your choices will be Sierra Nevada or Heineken. This may be Outside Lands’ best lineup yet, with artists that appeal to a variety of generations. Metallica, The Who, Gorillaz, and Lorde are headlining the festival that will also feature performances from A Tribe Called Quest, Fleet Foxes, Queens of the Stone Age, Solange, The Avett Brothers, Alt-J, Belle and Sebastian, and so many more. Yes, heavy metal icons and hometown heroes Metallica are headlining, but the local ladies are also representing. Be sure to check out Kamaiyah, a rapper from Oakland; K.Flay, the “Suburban Rap Queen” who got her start in the music industry while attending Stanford, and The She’s, an all-girl garage-pop band who met on an SF playground when they were 5 years old, formed their band when they were in 7th grade, and have been playing together ever since. The line-up for the Barbary Comedy & Improv Stage has yet to be announced, but last year featured performances from Portlandia ’s Fred Armisen, John Mulaney, Natasha Leggero, and a ton more. Outside Lands has a strict 10pm curfew, so the music won’t play a minute later. If you’re determined to keep the party going however, there’s plenty to do until the city shuts down at 2am. The official “after party” shows haven’t been announced yet, but last year there were intimate performances by Marian Hill, Ra Ra Riot, Juaz, and Griz at venues like The Independent, Rickshaw Stop, and Mezzanine. Best of all, your Outside Lands ticket gets you in for free. Just feel like grabbing a couple of drinks? You can do so with everyone else who just left the festival at any bar on Haight Street. Head to Alembic if you feel like a fancy cocktail; Club Deluxe for late night jazz with a cheap cover; Hobson’s Choice for all of the rum; or Gold Cane if all you want is a dive bar and a Miller Highlife. If you’re not in a rush to get to the festival, take some time to check out the other awesome stuff inside the park. Escape the chaos and craziness of the festival to take a Zen moment for yourself at the Japanese Tea Garden. It’s the oldest public Japanese garden in the U.S. and is home to pagodas, stepping stone paths, native Japanese plants, koi ponds, and an arched drum bridge that you must climb over. This man-made lake in the middle of the park is the perfect place to go for a little romance. Rent a pedal boat (it takes about an hour to go all the way around the lake), or climb to the top of Strawberry Hill -- the highest point in the park -- for breathtaking views. If you leave the festival along John F. Kennedy Drive, be sure to check out the Conservatory of Flowers which is putting on a spectacular light art installation every night from sundown to midnight in honor of the 50th anniversary of the Summer of Love. The illuminated scenes will stop forever in October, so this is truly a once in a lifetime experience. It’s not just about the festival food; you’ll need to sample some of SF’s best morning and late-night grub to keep you energized all weekend long. Head to Bacon Bacon in Cole Valley for all things (you guessed it) bacon. You can’t go wrong here. The McFrederick is a breakfast sandwich with housemade pork and bacon sausage, a fried egg, cheddar cheese, crispy bacon, and cream cheese -- all on an English muffin. If you’re not in a huge rush to get to the festival, make time for brunch at Zazie in Cole Valley. The French-inspired restaurant serves one of the best breakfasts in all of SF and the back patio is too charming for words. If you can make it to Haight Street by 11pm, then definitely go to Slice House by Tony Gemignani. If you’re movin’ a little slower, Escape from New York is also a great pizza option and it stays open until 2am. If it’s not pizza you’re craving, The Taco Shop at Underdog’s is in the Outer Sunset and is your best bet for Mexican street eats right by the park (since it stays open until midnight on the weekend). If you’re willing to go a little farther away, Finn Town (Castro) serves its late night menu until 1:30am on the weekend and the burger is one of the best in SF. Of course, you can never ever go wrong with a burrito from El Farolito, which is open until 3:30am on the weekends. Since there’s so much to do in San Francisco, you might want to stay longer than Outside Lands weekend. But whether you’re traveling to the festival or aiming for a staycation, just make the most out of every second. And as tempting as it is... don’t spend the entire time in Wine Lands.